A new year brings 12 new months of travel possibilities. From laid-back islands to adventurous safaris, here are the places I’m most excited to visit this year. The big, beautiful country in the North is turning 150 years old in 2017, and everyone is invited to its year-long birthday party. And the world's second-largest country even has a gift for you: Anyone can get a free Discovery Pass (worth $136) that provides free entry to all of its national parks in 2017, including the breathtaking Banff National Park. Beyond its immense natural beauty, Canada's cities are truly having a moment. A good part of the action will center around the capital, Ottawa, which is putting on a solid 12 months of festivals and events. Montreal, in the spirit of its famous export Cirque du Soleil, is also filling the calendar with a carnival of fantastic celebrations in honor of its own 375th birthday. And, with a weak Canadian dollar pushing down prices, the overseas visitor should have plenty of pocket money to spend on Canada’s phenomenal culinary scene and mysteriously underrated wine. The Emerging Jewel of Europe. It's got the sights, culture, and cuisine, yet Portugal still manages to fly under the radar. Perhaps it's this mystifying lack of recognition that helps the country remain a bargain. Add the weakness of the euro, and a visit to Portugal looks like an unbeatable deal. Its capital, Lisbon, is one of the most vibrant, good-value, ebullient and attractive cities in Europe. The country's second-largest city, Porto, offers a stunning setting on the Rio Douro. TAP Portugal, the country’s airline, has recently introduced $799 round-trip tickets from New York to Lisbon that includes a free optional stopover in Porto, and not to mention the fleet of budget airlines from around Europe that makes getting to Portugal easier than ever. Alternatively, consider a stopover in the Azores, an archipelago in the middle of the Atlantic with an astonishing diversity of terrain: lush volcanoes, medieval villages, relaxing hot springs, and towering cliffs. But it's a secret that won’t last: the Azores have seen a 31% increase in tourism over the last year, so make a trip in 2017 before things really take off. Oregon is one of those places that doesn’t try to impress anyone but somehow impresses everyone. The state seems to have almost everything except the crowds. It has the highest concentration of waterfalls in North America, each of them staggeringly beautiful. It has a coastline that rivals that of California's, with the added bonus of no traffic and tourists. Above all, the entire state has no sales tax which makes it a serious shoppers' paradise. However, in 2017, the biggest draw to the state is an occasion that hasn't been seen in the United States for almost 40 years — a total solar eclipse on August 21, 2017. While you may have probably seen a lunar eclipse or partial solar eclipse in your life, this is the grand- daddy of all celestial phenomenon. For a brief minute or two, day will suddenly turn into night as if the sun mysteriously vanished from the sky. It's a completely surreal experience that will be etched into your memory for the rest of your life. Portland, the state's largest city, is America’s city of the future: a friendly, sustainable, ethical place that values good living and leisure over acquisitiveness and ambition. World-class wineries and microbreweries are all within a short driving distance, making the city a good place to based yourself while waiting for the eclipse. But don't get too drunk and miss the show — it won’t happen again in Oregon for nearly a century. When I arrived in Moscow on the Trans-Siberian Railway in 2011, it was staggering. The city was grand and breathtaking to the point that it almost puts Paris to shame. You can feel the sheer ambition of the Soviet Union from just walking around. The city's most popular attractions are still extremely worthwhile, from the imposing Kremlin complex to the candy-striped domes of St. Basil's Cathedral. As the country gears up to host the 2017 FIFA Confederations Cup and the 2018 FIFA World Cup, Moscow is ready to show the world how much it has to offer. And with the Russian ruble hovering at a tempting exchange rate, the country has never been more affordable. Island Life with British Flair. From most major east coast US cities, Bermuda is a quick hop away — a ridiculously short two-hour flight. The island has pulled itself out of stagnation and barreled its way into the future with some big changes. The most famous development is the $100 million overhaul of the Hamilton Princess & Beach Club, the island’s 132-year-old grande dame, which has a stellar art collection and infinity pool overlooking the harbor. James Beard Award and Top Chef winner Marcus Samuelsson's new restaurant, Marcus, serves locally sourced fare and is one of the island's top draws. In 2017, Bermuda will host the world's most prestigious sailing race, the America's Cup, which culminates with two months of racing and events in May and June. Cape Town has been working hard on its cultural and culinary scene to cement its reputation as an African city with a global outlook. The Zeitz Museum of Contemporary African Art (MOCAA) opens in 2017 and is heralded as South Africa's answer to New York's MoMA and London's Tate Modern. It will be the world’s largest museum of contemporary African art and occupies a soaring century-old grain silo. Don't miss Chef Luke Dale-Roberts' acclaimed restaurant, The Test Kitchen, which was recently ranked 22 on the World's 50 Best Restaurants list. Home to an Endangered Species. Just two decades ago, Rwanda was the site of one of the worst genocides in human history. It’s astonishing to think how the country has quickly transformed itself into one of the safest and forward-looking countries in the region. Instead of ignoring its past, the country stares at it right in the face, through its museums and education. The main draw of Rwanda, though, is that it’s one of the very few sites in the world where you can see mountain gorillas in the wild. In June 2017, it will become even more enticing when Wilderness Safaris’ upscale Bisate Lodge opens near Volcanoes National Park, where visitors can see the critically endangered animals. With dramatic views of the forested volcanic peaks, this new safari lodge is making a firm commitment to fund conservation projects and community development. A limited number of people are allowed near the gorillas each day, and now is the time to make the visit — a mere 800 mountain gorillas are left in the wild. Just to the north of Australia, Papua New Guinea has remained mostly untamed and unspoiled. Life pretty much goes on as it has for centuries for its indigenous cultures in their secluded villages. While the country still only attracts the adventurous, recent homegrown tourism initiatives have made planning and booking your trip easier. Travelers adventurous enough to make the journey there are rewarded with volcanic fjords, vibrant coral reefs, and vast rainforests — home to the threatened tree-kangaroo and Queen Alexandra’s birdwing, the largest butterfly in the world. South Korea has often had to live in the shadow of its more well-known neighbor, Japan — but 2017 might just be its year. This is, after all, a country rich with culture, cuisine, and city life. For over a decade, its capital, Seoul, has been striving to become a more attractive and tourist-friendly metropolis. Seoul’s brand-new 1,820-foot Lotte World Tower is the tallest building in the country and its observation deck (floors 121 to 123) is one of the highest in the world. In the latter part of 2017, the city will unveil the Seoul Skygarden. Touted to rival New York's High Line, it’s a stunning urban garden that will stretch for nearly a kilometer, with performance spaces, cafés, and street markets alongside 254 types of trees, shrubs, and flowers from across the country. The New Frontier of the Caribbean. Cuba has spent decades as a forbidden destination, a tropical bastion of communism whose mystique was amplified by the fact it was largely off-limits to Americans. 2016 was the year Americans finally started going to Cuba again after nearly 50 years, as the restrictions loosen (but not completely). And now that the United States and Cuba have agreed to restore commercial flights, it’s all that much easier to get to. With the sharp rise in the number of Americans visiting, the country is changing quickly — for better or for worse. It's worth highlighting that this is a destination that I would visit sooner rather than later. Donald Trump has threatened to restrict Americans’ right to travel there, and meanwhile, hotel prices are skyrocketing exponentially. It may seem, then, Cuba is at risk being off-limits to most Americans once again. Nashville has truly come into its own, and 2017 looks to be its banner year. The Ryman Auditorium turns 125 years old, the Country Music Hall of Fame & Museum is celebrating 50 years, and the Bluebird Café will be having its 35th anniversary. There’s a fabulous food scene with new and upcoming eateries. In fact, some 85 people are moving here every day. On August 21, just like Oregon mentioned above, you’ll be able to see the super-rare total solar eclipse from the city. While you’ll need to drive out from Portland in Oregon, you can stay put in Nashville — it’s the only major American city in the direct viewing line for the eclipse. Finland celebrates 100 years of independence in 2017, with events planned in every region. Expect everything from al fresco concerts and culinary experiences to sauna evenings and art exhibitions. Finland’s 40 national parks, 12 wilderness areas, and 6 national hiking areas are sanctuaries for nature-lovers. The country is also hosting the World Figure Skating Championships and the Nordic World Ski Championships this year. All these coupled with the fact that you may be able to catch the elusive northern lights while you’re there, makes the country an incredibly tempting trip. Decades of civil war and violent crime meant Colombia was out-of-bounds for most sensible travelers. Fast forward to the present day, you’ll be hard-pressed to find any signs of conflict in the country. Colombian President Juan Manuel Santos was recently awarded the 2016 Nobel Peace Prize for his efforts to end the 52 years of war. Moreover, the country is expecting a visit from the Pope Francis in 2017. On the Caribbean coast, Cartagena is a fairy-tale city of romance and preserved beauty lying within an impressive 13km of centuries-old colonial stone walls. The old town is a UNESCO World Heritage site – a maze of cobbled alleys, balconies covered in bougainvillea, and massive churches that cast their shadows across plazas. Germany’s second-largest city and biggest port has always been one of its most intriguing cities. Located on the Elbe River near the North Sea, Hamburg is laced with canals. On top of that, Hamburg has more bridges (over 2,300) than Amsterdam, Venice and London combined. When the tide cooperates, you can cruise the canals crisscrossing Speicherstadt, one of the world’s largest historic port warehouse districts. Recent years have seen the banks of the Elbe River morph into an architectural wonderland, with icons such as Zaha Hadid’s River Promenade reshaping the landscape. For Once Without the Crowds. It's been over a year since the attacks on Paris and other parts of France. It's worth remembering that your chances of being caught up in a serious incident in France are still extremely small. Meanwhile, some travelers have been scared off by the incidents, meaning this notoriously tourist-filled destination might just be a little quieter in 2017. Today, when you step into the Louvre, you're less likely to be battling crowds in front of the Mona Lisa. A reservation at L'Arpege, Guy Savoy and the city's other temples of gastronomy is a possibility rather than a pipe dream. And with hotel occupancy down 30%, and the euro trading at a low, France is suddenly affordable. The police presence is palpable, and people are taking care of one another. There's never been a better time to go. Known more for its religious sites and ancient monuments, Jerusalem has proved that it has way more to offer. Its culinary scene has blossomed to rival Tel Aviv. The Jewish diaspora and the Middle East merge at restaurants like Ishtabach — try the Kurdish shamburak, a pastry with brisket, potatoes, and chimichurri — and Machneyuda, known for its standout beef tartare with plums. At the sprawling Mahane Yehuda Market, food-and-drink spots have popped up in produce stalls, many of which stay open long past sunset. In March 2017, Brown Jerusalem Hotel will open complete with a new bar in an underground water cistern. Uruguay has always been something of an underdog. After two centuries living in the shadow of its neighbors, South America’s second smallest country is finally getting a little well-deserved recognition. 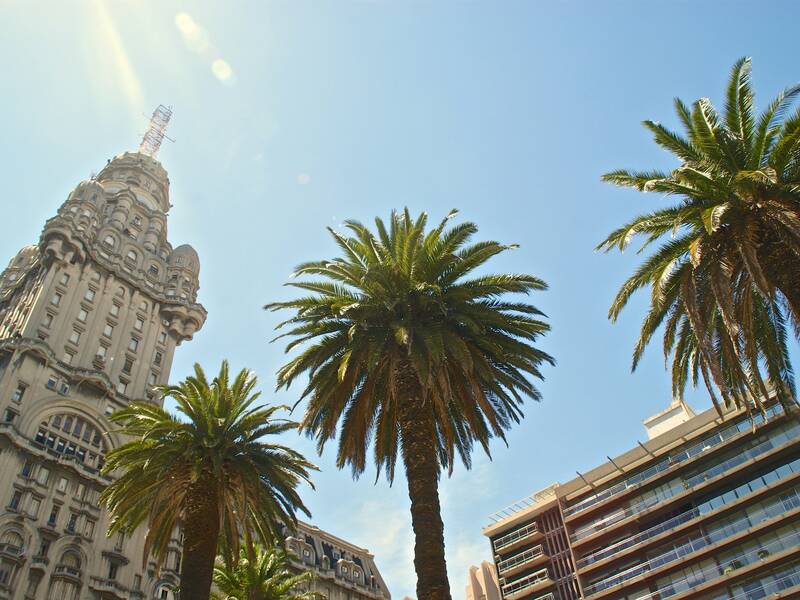 It’s an easy overnight flight from the US to Montevideo, the seaside capital that feels like a smaller, tidier version of Rio. The city has gorgeous beaches that stretch for miles, terrific food including some of the world’s best beef, phenomenal small-production wines that are surprisingly affordable. From there, press on to the country’s wild, eastern shores, where sleepy surf towns like Punta del Diablo and miles of perfectly golden beaches await.